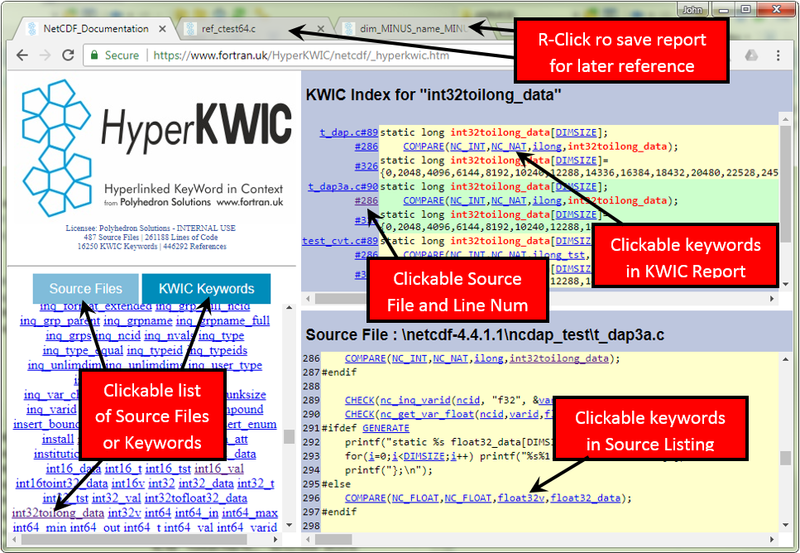 HyperKWIC generates software documentation that combines the instant connectivity of hypertext with the analytical strengths of KeyWord In Context. It produces HTML documents that provide a fully interactive alternative to traditional documentation. HyperKWIC is a part of the plusFORT toolkit. It is also available as a separate download (free for not-for-profit, non-government use – including evaluation). Meet requirements for accurate and complete software documentation with the aid of HyperKWIC reports which are generated automatically and quickly. Update as often as required, and publish to your team and to other stakeholders. HyperKWIC reports may be stored locally or published on an internal or external website. Impact Analysis: Even small changes to an established code base can have consequences that propagate through the entire program. With HyperKWIC you can quickly assess possible changes and produce a plan to minimize coding effort. which routine set that value? HyperKWIC is aware of programming language syntax, including comments and reserved words. Syntax rules for several common languages are defined in an external file, which may be customized as required. R-click to open a separate tab for reports you will need again later.